It's been a strong year for high-end compact cameras, with well-established manufacturers honing their craft and new additions also appearing. It's made for a bustling market, but one that also makes that purchase decision all the harder. 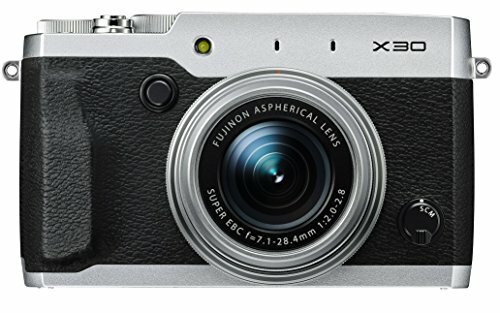 The Fujifilm X30, which represents the third generation of the company's 2/3-inch sensor-size compact series, is a little larger than its X20 predecessor, but also boosts the feature set with an all-new built-in electronic viewfinder. But in light of the comparatively micro-scale Sony Cyber-shot RX100 III and the similar-sized Panasonic Lumix LX100 - both cameras with larger sensors than the X30 - has Fujifilm's retro-themed dominance lost its swagger? We've always had a soft spot for the Fujifilm X-series. The retro style found throughout the range won't appeal to all, but it was the company to start the retro resurgence and that aesthetic is still strong with the X30. We think it's a great look (although we prefer the black and silver option, not the all-black review model as shown here). At a glance it's much the same camera as its X20 predecessor, all solid metal construction and rigid lines. But it is a bigger beast than before: at 118.7 x 71.6 x 60.3mm it's 1.7mm wider, 2mm taller and 3.5mm deeper than the X20. Which might sound like next to nothing, but it really shows when the two products are sat side by side, and with the far larger-sensor Panasonic Lumix LX100 being hardly any bigger than that, the not-so-pocketable Fujifilm X30 now exists in a different world. It's a bold move, but one that has logic: there's that new 0.39-inch, 2.36m-dot electronic viewfinder built into the design that requires a little more space for its accommodation. Previously the finder was a limited 85 per cent field-of-view optical version with electronic overlay that, while clever, has been superseded by the X30's solution. It's a far better finder-based experience too, comprising a what-you-see-is-what-you-get view that's packed with detail. It's not completely lag-free in darker conditions, but for a compact camera under £500 it's an impressive experience that we used a lot. The equivalent 0.65x magnification (the X20 was 0.48x) means the image is large, and even as glasses wearers we've found it easy to use once directly lined-up to the eye. At this price point you won't see a better electronic viewfinder in a camera. A staple of X-series cameras are their control dials, and while the X30 doesn't go the whole hog like its X100T bigger brother, the inclusion of separate mode and +/-3EV exposure compensation dials makes the user experience more immediate. Paired with a quick menu "Q" button to the rear, alongside a small thumbwheel, controls are never far away from your fingertips. The other primary feature is the 28-112mm f/2.0-2.8 equivalent lens complete with twist-barrel zoom - so none of the ultra-slow shutter toggle controls to be found here - and a new smooth-rotating focus/control ring. It's the physicality of these elements that really helps set the X30 apart from its competitors, and is one of our favourite features about the camera. We much prefer twisting a lens barrel to jump between the wide-angle and full zoom extension, and as an extra quirk twisting the lens into its stowed position switches the camera off. However, as much as we like the lens it's a shame that it hasn't stretched to a 24mm wide-angle equivalent this time around, as is becoming far more standard. Customisation is high too. That news lens ring can be configured to adjust ISO, white balance, burst shooting and film simulation mode options, or left to its default setting. We've found it best suited to default settings adjustment - aperture value when in aperture priority, shutter speed when in shutter priority and so forth - but that does see it duplicate the function of the rear thumbwheel, which some may find odd. Elsewhere there are six configurable function buttons. While only one is marked with "Fn", the four d-pad directions and the one-press movie button atop the camera can each be reprogrammed. There's a much wider array of settings to pick from here - no less than 22 in fact - ranging from macro to ISO, to self-timer, image quality and more. Much like the lens, the X30's sensor is also an echo of its X20 predecessor, the same 12-megapixel 2/3-inch X-Trans CMOS II sensor. So no upgrade for this model in the 18-months since its predecessor - but more about image quality later. For its single autofocus ability we've found the Fujifilm X30 to be impressive, although the lack of a touchscreen is an ongoing absence in this series - and one we feel would have come in handy from time to time in this release. Focus doesn't hang around, though, locking onto subjects at pace, showing that Fujifilm is pushing forward in this important areas. In some darker conditions it's slower, but that's to be expected. Occasional focus slip-ups did occur, but sometimes it would be down to being too close to a subject or a lack of contrast in the desired focus area. There are 49 available focus areas and the selected focus point can be adjusted between five available sizes from small to large using the rear thumbwheel. Perhaps best of all is that this information can be delivered to the viewfinder in full, and as the finder is aligned slightly to the left rather than centre it's possible to use a right hand to adjust autofocus using d-pad and rear thumbwheel controls. It's not as easy as using a toggle/joystick arrangement as you might find on a DSLR, but after learning the layout it works just fine. However, we doubt you'll be rapidly seeking focus point changes in that arrangement as the continuous autofocus option - selected using the front single/continuous/manual selector - isn't up to much. Trying to capture a nut-hunting squirrel in out in the park saw success when stationary, but each subject movement saw continual over- and under-focusing. In the end we just used the single autofocus option instead. Much like the X20, the X30 is a casual street photographer's kind of camera, not a super-fast DSLR replacement for shooting motor-racing and the like. Shift into manual focus and the addition of that new smooth rotating focus ring around the lens makes for a great experience. As the focus ring sits almost flush with the base of the camera, the fact it's nested right against the bulk of the camera body isn't a huge bother - it's still easy to get a decent grip on for good rotation. The X20 didn't have this ring at all, instead it used the rear thumbwheel, so the new solution is much cleaner this time around. There are some additional extras that aid precision manual focus, including focus peaking - a feature that highlights subject edges in a user-selected colour, such as red or yellow - and manual focus assist which zooms in to a 100 per cent equivalent on the screen or in the viewfinder for heightened accuracy. While the X30 hasn't got the overall more advanced system of the Panasonic Lumix LX100, it still asserts its abilities within this price bracket and does a good job overall. Just don't rely on the continuous autofocus. However, having just reviewed the LX100, we've often preferred using the Fujifilm instead. The reason is simple: the tilt-angle screen makes a big difference. Maybe it's because the clocks have changed, it's autumn, and the leaves falling demand those close-to-the-floor shots. But we've often had the tilt-angle screen positioned at 90-degrees horizontally for waist-level work. Then there's the slightly smaller sensor, which means up close macro shots are no problem at all. A left click of the d-pad will bring up the options for standard, macro and super-macro - the last of which can achieve focus just 1cm between subject and lens at the widest-angle 28mm equivalent. It's impressive, particularly when combined with the f/2.0 aperture for blurred background, while the centre of the lens delivers quality sharpness. Oddly, however, there's still no neutral density (ND) filter and although the camera is capable of 1/4000th second shutter speeds, this is capped at 1/1000th second for the widest f/2.0 aperture, and 1/4000th second only becomes available from f/9 or smaller apertures. It's an unavoidable restraint given that the X30's shutter mechanism can't clear the physical aperture size in the given time frame, which would otherwise result in bodged exposures and a "crushed-bokeh" effect. Perhaps the X30 should have opted for a newer, faster mechanism - if such a unit exists. In perspective this shutter speed limit is more apparent given the Panasonic LX100 has the option of a silent electronic 1/16,000th sec option. No electronic shutter option to be seen in the X30. We raved about the Fujifilm X20's image quality, and the X30 is on par with that camera thanks to using the same sensor. Which is good news, and yet in the 18-months between one camera's release and the next the context of the high-end compact camera landscape has shifted. We've finally got the Sony RX100 III with a faster lens than the two first attempts, while the Canon PowerShot G7 X also gives the Fujifilm something to think about. Because, in 2014, a 2/3-inch sensor isn't as giant as when it was first introduced. However, we're still impressed by the standard of the X30's resulting picture quality - at least towards the lower end of the ISO sensitivity spectrum. The X-Trans CMOS II sensor foregoes the use of a low-pass filter and, therefore, the light isn't diffused for sharper results. The 12-megapixel count is also on the right side of conservative, giving each "pixel" site more room to breathe and more light to obtain. At the lowest ISO 100 sensitivity we've shot some crisp, bright and well exposed shots that aren't too different from their raw counterparts, bar for a little lens correction at the wider-angle that can negate some detail. There's a touch of grain but that adds to the overall quality, and this more or less continues throughout ISO 200-400. There's a little less clarity by the time ISO 800 is put to use, but even in the case of our example squirrel shot there's ample detail on show. JPEG processing disguises the increase in grain thanks to subtle processing that also sees a contrast boost. Some deeper, darker shots lose some shadow definition for the sake of contrast, though, but open up the raw files and you can reclaim that as needed. It's at the four-figure ISO sensitivities where the ceiling limit is reached (despite ISO 12,800 being a pointless available option). ISO 1600 isn't too bad, certainly usable despite some colour noise being more prominent, but ISO 3200 is a considerable step away from that with lots of image noise and processing that heavily manipulates the JPEG image. Hopefully the fast maximum aperture will be enough to avoid using this ISO setting, as we've as good as deactivated it within our Auto ISO settings. And settings come aplenty. Rather than just the one Auto ISO setting there are three that can be customised with low- and high-end limits, plus minimum shutter speed values set. Just as it should be for a high-end compact. Beyond that there are in-camera adjustments for Color, Sharpness, Highlight/Shadow Tone and Noise Reduction, alongside Film Simulation options that can be used in combination throughout any of the eight user-defined custom settings. The X30 is a camera you can set-up just as you want. Despite tinkering with settings, we did think the default white balance and colour saturation was lacking punch, with a lean toward blues more than yellows in many instances. Again, that could be put down to the auto white balance trying to compensate for this time of year - as it should be no different to the good experience we had with the X20 - despite the low-slung warm sunlight. Plenty of image control from that fast lens and decent sensor see the Fujifilm X30 still excel when it comes to image quality - ignoring the poor high ISO performance, that is. The advancing nature of the X30's competitors really highlight that high ISO ability is this camera's Achilles' heel. As we declared in our initial Fujifilm X30 preview, this camera is bigger, bolder and better than its predecessor. But the high-end compact camera landscape has changed, and it's the pressure from its surrounding competitors that makes it difficult to feel as five-star thrilled about it as we did its predecessor. If size is your priority the Sony RX100 III makes a stronger case. Want better image quality overall then look to the pricier Panasonic LX100. But having used the X30 for a week it has still really impressed us. The twist-barrel lens and tilt-angle LCD screen made it easier and often preferable to use than the pricier Panasonic Lumix LX100 in our book. And it's difficult to be critical of the low-mid ISO shots which show off plenty of detail thanks to the already proven 28-112mm f/2.0-2.8 equivalent lens. We'd like a slightly wider-angle optic next time though, and are surprised by its absence this time around. Although the Fujifilm X30 has arguably lost its claim to the throne as the best-in-class high-end compact, there's a lot to be said for the physical controls, useful features, eye-catching design and, importantly, accessible price point. Competition is rife (and often a lot more expensive) but the X30 remains in the mix with one hand still on the crown. It remains relevant and we've still got a lot of love for it.